Jean | Sophisticated Diva ~ A.K.A. Along came Polly! Miche Throwback Thursday ( TBT ) Feb 13, 2014 — get them while they last! It’s time for MICHE throwback Thursday!! Today you’ll have the opportunity to purchase THREE Miche shells at amazingly low prices! This sale continues through 8am MT Friday 2/14/14 — BUT, only while supplies LAST!! Each shell will be located in it’s correlating spot under “petite” shells, “classic”, and “prima” shells on my personal website. You may not be heading out to sea soon, but you’ll definitely feel like you’re at the helm and in control of your day when you carry the Navy-inspired Jean Shell for Petite Bags on your arm. Delightful high-gloss navy blue faux leather in an embossed woven pattern is topped off with black detailing, white stitching and a chic knotted tie. Pocket style gives you extra storage on the ends too! You may not be heading out to sea soon, but you’ll definitely feel like you’re at the helm and in control of your day when you carry the Navy-inspired Janelle Shell for Classic Bags on your arm. Delightful high-gloss navy blue faux leather in an embossed woven pattern is topped off with black detailing, white stitching and a chic knotted tie. Pocket style gives you extra storage on the ends too! You may not be heading out to sea soon, but you’ll definitely feel like you’re at the helm and in control of your day when you carry the Navy-inspired Janice Shell for Prima Bags on your arm. Delightful high-gloss navy blue faux leather in an embossed woven pattern is topped off with black detailing, white stitching and a chic knotted tie. Be sure to check out the chic “elbow patch” detailing on the bottom corners. Miche Cyber MONDAY 2013 here!!! Monday and Tuesday ONLY deals, plus black Friday specials are still in effect! IT’S THE NEXT EXCITING Miche sale of the YEAR!! Cyber Monday, with low rock bottom prices on your FAVORITE MICHE SHELLS, ACCESSORIES, WALLETS, AND JEWELRY!! More exciting products are being added AT 12:01 AM MOUNTAIN TIME—save up to 75% on single items. Don’t wait—when they’re gone, they’re gone! NOW’S THE TIME TO GIVE THE GIFT OF MICHE FASHION, AND SAVE! CLICK HERE to go to my personal website at 12:01AM MT, and don’t miss out! Order early, there will be many sell outs with prices this low!!! THAT’S NOT ALL!!! The Black Friday Miche sale is still going on!! You can grab your Cyber Monday deals along with your Black Friday deals!! Check them out HERE. 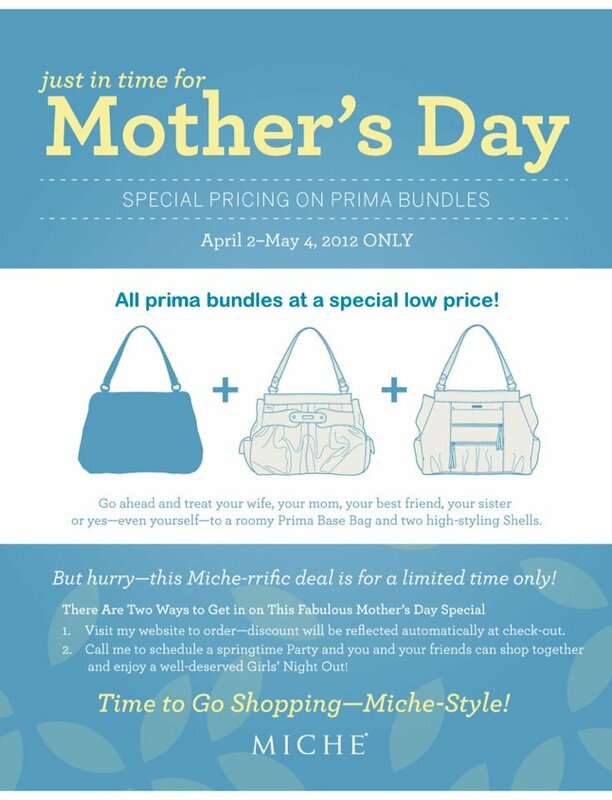 Miche MAY PROMOTION—customer specials, Mother’s day is coming soon!! Spend $100-$149 (SUBTOTAL) get a shell from THIS CATEGORY (tier 2) AND a shell from tier one…FREE!! INVENTORY IS LIMITED–DON’T MISS OUT!! 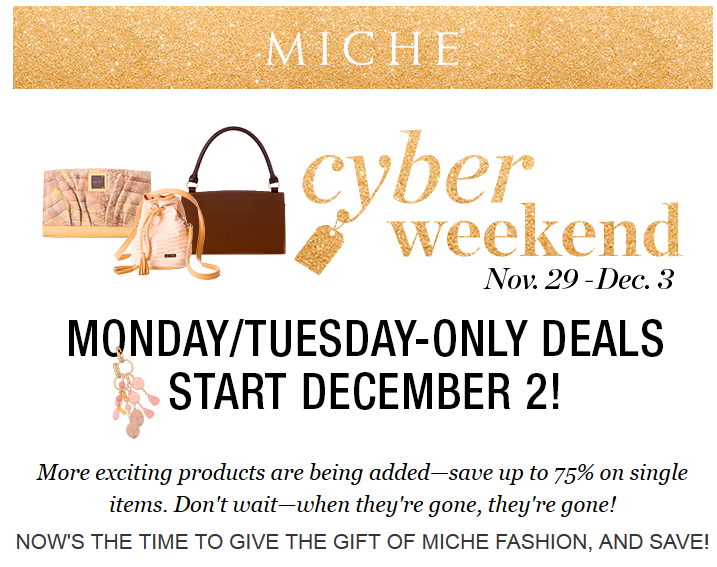 Get ready for ROUND 2 of Miche’s CYBER MONDAY WEEKEND!!! Yes, there’s still more in store for you — but don’t be late, as items have been flying off the shelves through the weekend, with an overwhelming response from customers!! We LOVE our Miche!! These shells will be 50% off. Right now, go to https://diva.miche.com/shop?partyId=137517 and sign in as a new customer, if you haven’t done so! It will save you precious time trying to navigate the sign up process! I’m sorry, at this time, photos not available at this time, but will reflect on the website at 12:01 AM MT!! Check your time zone and set your alarms! !